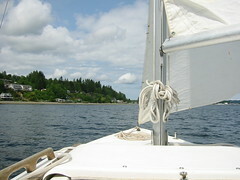 No shipwrecks or deserted islands, just gusty winds, Yukon Harbor and Blake Island. Since I was alone today, and it wasn't raining, I took the opportunity to do some sailing. The wind was out of the southwest so there was no swell, but warm gusts came of the land. Having sailed these waters for almost two decades, I have started to notice patterns with each wind direction. (I know, I'm slow!) It was great to be on the water, dancing with the wind and waves. I also managed to do some domestic things like mow lawn, buy paint and meet with Olanders about building their deck this summer. Esther was with Camie all day in Sequim, Markus was at WWU with a couple of friends and Calvin was at Josh's. The weather continues to be muggy, but no rain.